According to various hobby groups, this model/toy set may be released soon. At 1/100 scale that is nearly four feet tall! Hope it is as good or better than the shuttle. 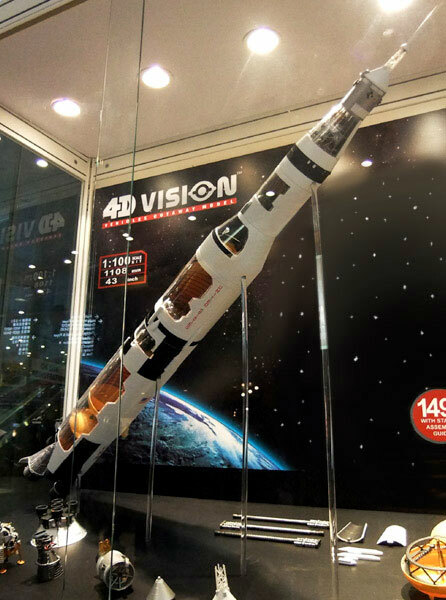 I saw the first pictures of the 4D cutaway Saturn V.
That is super news! Looks very good except for the black roll pattern between the S-1C and the S-II stages but that can be fixed with some black paint. OK, all of you modelers out there need to start planning for a Skylab modification to this one! 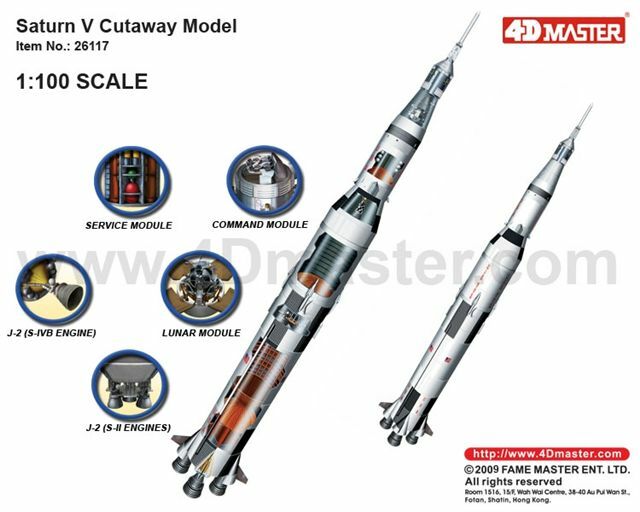 Saturn V Cutaway Model Famemaster 2010th Scale 1:100 After the great success with the Shuttle 3-model (praise from all sides on the outstanding quality) brings Famemaster the International Toy Fair in Hong Kong's long-awaited model of the Saturn V on the market. The model is simple zusammengsteckt. Impressive are the size specifications: diameter 10 cm, height: 1,11 m. With great insight into the inner workings of the moon rocket. 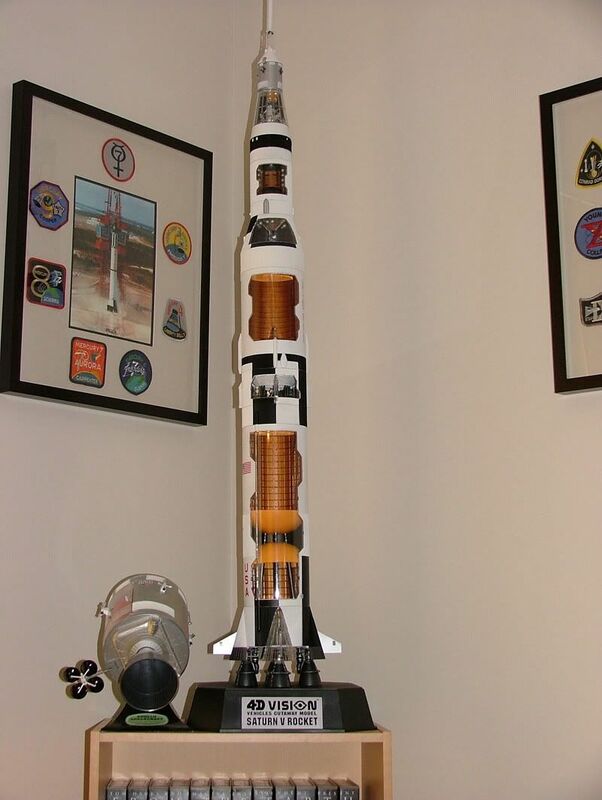 Here the first from 4D photos of the cutaway Saturn V 1/100 and more future models. I see even a Lunar Module 1/24, that must be great! All the visitors were deeply impressed by high quailty finish 4D VISION Vehicles Cutway items. Such as our 1:72 Saturn V Rocket and 1:32 F-14 Cutway Models. 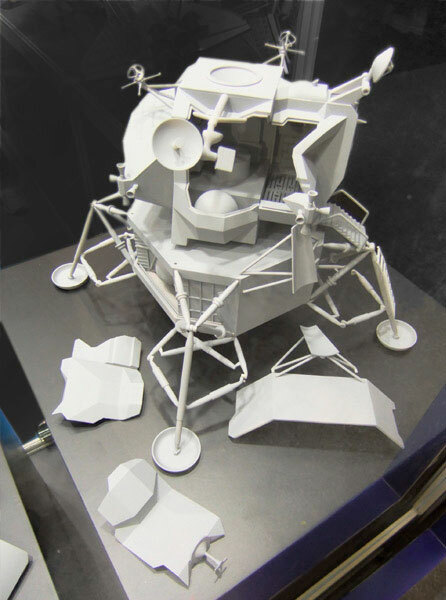 We also showed the other coming soon items, like the 1:24 Apollo Lunar Module and 1:32 Apollo Command & Service Module too. The Lunar Module looks nice! I wonder if this is a prototype since it's not painted? According to FameMaster's website, the photos are from their booth at the 17th Hong Kong International Toys & Gifts Show held October 20-23, 2009. Why did I spend over a year of my life and $350 to kit bash the 1/96th Revell model? I should have waited and saved the money. We are all asking this questions: Maybe that is why I pushed so hard to get a museum built. I wonder why they didn't design the CSM and LM in compatible scales, but made them different kits? This does look exciting but would be first interested to learn how technically accurate the 1:100 (1:72?) scale model(s) are. Why did I spend over a year of my life and $350 to kit bash the 1/96th Revell model? I actually stopped building my 1/96 Saturn V model. This model is so much better and faster to assemble. I am really looking forward to seeing the finished Lunar Module. I too would be interested in the accuracy of this model. Pictures look great. Hope to see it in the flesh. Look at that F-1, and the LM. This is a model that begs for super-detailing. That would be a nice replacement for my Revell 1/96 I have above my couch in my living room. About the same scale. My Saturn is starting to turn a little yellow on the plastic of the wrap-around stage plastic. 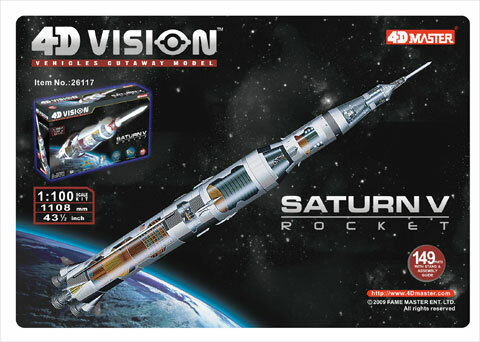 I'm really excited about the Famemaster Saturn V! Since I'm still quite a beginner when it comes to building scale models, I've decided to wait with the Revell Saturn V and buy the great looking Famemaster model. Does anybody know if you'll be able to display the stages individually? The Saturn V is basically the same as the shuttle that FameMaster makes. It is part model and part puzzle with great detail! Does "part model" imply glue and paint? If so, I'll pass - had my share of those; and does "part puzzle" imply that there are no assembly instructions — or poor ones so that you have to figure it out for yourself? No glue or paint necessary; and yes, instructions are included (though initially they may be in Japanese). The Saturn V, like the space shuttle that preceded it, comes in parts that fit together like a puzzle, or more accurately like any other building set, such as LEGO, only there are far fewer parts to piece together. If you study the video on Famemaster's website closely you can see the detail and paint job. It's not crude but it's not excellent either. I think for display purposes it will be totally adequate at small distance. Woo-hoo! It arrived today. WOO-HOO! It's arrived! I am a novice at these particular kits: it says 'snap together'; how good is it, or do I need to use a drop of super-glue every now and again? Nice. How easy was it to assemble? Any tips? The instructions I got seem to be a little out of date. Part number 6 (onto the F-1 engines) were really iffy. They varied in size but at least all did stay on. Identifying the top/bottom of the S-IC tanks wasn't clear, though a bit of logic worked it out. Fitting the 'pipes' (part 14/15) took a little effort. I didn't know how much force I could use, but I got them to fit correctly without breakage. On page 8, the diagramme seems to indicate that the parts 32/33/34 go at the top of the S-II stage, but in fact they go together at the bottom. Part 46 was not in the kit nor could I find where it was meant to go. Part 52 (the interstage) had poor painting, with blurry paints lines/overspray. Sequence of the S-IVB stage is a little unclear, but again common sense works it out. I got fooled by the LM. Knowing how the real LM had its legs folded in made me assemble the legs that way (which you can) rather than the 'straight' legs indicated by the instructions. If you do that, however, the LM sits too high and you can't sit the CSM properly on the SLA. The plume deflectors (part 109) for the LM didn't fit properly because the recesses on the descent stage were poor and didn't allow a clean fit. They fall off at the drop of a hat. I got the impression from page 13 that the SLAs panels could be folded in and out. Nope - I snapped off the pivot from one of the clear SLA panels (part 76) but fully assembled it stays in place. Despite all these problems, I like the kit. You've done a beautiful job of building her. That is just amazing. Now who is going to build the first Skylab version. No problems - I'm quite happy with it. The 4-D Saturn V got to the local model shop up here last Thursday, which just happened to be my birthday. I didn't get a change to work on it until this morning. It's raining and windy up here, so it was a good time to put it together. First off, I want to thank Obviousman for that detailed review of his construction issues. I followed your suggestions and avoided those problems. I found the model fairly easy, but as I said before, I knew what to look for in problems. It took me about 3 hours of slow work to put 100 or so pieces together. The most complex piece was the LM. It was the only place where I used glue was to connect the LM descent stage together. I also ran into a similar problem as Obivousman on the LM in the SLA. I believe they made the H2 tank bulkhead just about an 1/8 inch too tall. Even with the LM legs in the folded position I had trouble fitting the CSM onto the SLA. I cured the issue by cutting an 1/8 of an inch off the H2 tank bulkhead. That solved the problem nicely and you cannot see the work, since it is hidden by the IU ring. One major issue to me is the stand. There is no support other than some indents in the stand itself and that is just an accident waiting to happen. There are the minor issues of paint detail, but they did a very nice job in creating a cutaway model that is fairly easy to build. It shows the internal workings very well. I have waited years and had several false starts with model makers in my attempt to get a cutaway model of the Saturn V. This model company did a pretty good job. For the people who have one, what are they doing about the flimsy base? Nothing, at this time. I'm not sure what I can do anything anyway. While I was gone for the day I came home to a completed model, thanks to my beautiful wife. Here it is in it's new home, it takes its place among models built by some other modeling greats such as Steve Nichols, Carlos Santos, Nick Proach and of course my wife Jackie. Just finished my Saturn V.